Alexander Hartmaier, Professor of Mechanics of Materials at Ruhr-Universität Bochum / Germany and Director at the Interdisciplinary Centre for Advanced Materials Simulation (ICAMS), was recently appointed to a Visiting Professor of the Chang Jiang Scholar Program at the Harbin Institute of Technology (HIT), in recognition of his outstanding research achievements in multiscale material modeling. The tenure of the guest professorship will last from March 2016 to February 2019. During this time Professor Hartmaier will cooperate with Professor Tao Sun and Professor Junjie Zhang of the Center for Precision Engineering to lead a research group on “Material-oriented modeling of ultra-precision machining”, and will also hold annual compact courses for undergraduate and postgraduate students at HIT. Furthermore, the award will help the Centre of Precision Engineering at HIT and ICAMS at Ruhr-Universität Bochum to intensify their scientific cooperation. The Chang Jiang Scholar Program, also known as Yangtze River Scholar Award, is issued by the Ministry of Education of the People’s Republic of China and it is considered to be one of the highest academic awards in China. The Chang Jiang Scholar Program was established in August 1998 to acknowledge special contributions made by Chinese scientists and international scholars in various research fields. To be considered for this award, international candidates must have achieved outstanding international recognition in their respective fields. The Chang Jiang Scholar Program is part of an ambitious program initiated by the Chinese government to rapidly develop and improve the quality of research conducted at major research universities in China by collaborating with eminent scientists throughout the world. 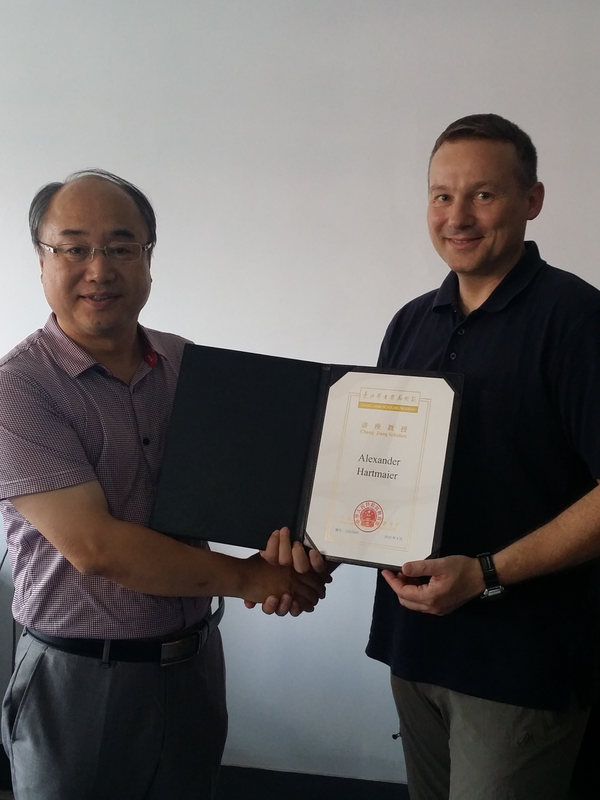 Professor Tao Sun, the director of the Center for Precision Engineering of Harbin Institute of Technology (HIT), awards the certificate as Visiting Professor of the Chang Jiang Scholar Program to Professor Alexander Hartmaier (July 2016).